Abstract. 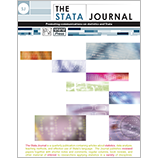 In this article, we describe the Stata implementation of Baltagi and Li’s (2002, Annals of Economics and Finance 3: 103–116) series estimator of partially linear panel-data models with fixed effects. After a brief description of the estimator itself, we describe the new command xtsemipar. We then simulate data to show that this estimator performs better than a fixed-effects estimator if the relationship between two variables is unknown or quite complex.